The boiler or pump is noisy. Combination boiler blocked heat exchanger. Hot water demand boiler fires up then goes off. Radiators have cold spots or do not work. Radiators need constant bleeding or accumulated air. Evidence of black sludge and rust in the system. All of the above can result in the need for a powerflush. Powerflushing removes these deposits and the problems that they cause. We use the latest Kamco powerflushing equipment to achieve the best results. It would be helpful for our team to know type of boiler, make and model as well as the number of radiators at the property (not imperative). The cost of this service starts from as little as £250.00 plus VAT. Please contact us or call 0800 389 9613 today for a free quotation. 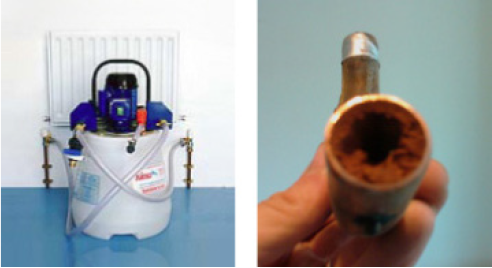 Over time, central heating system water accumulates harmful dirt and debris, such as rust and solder fragments shed by older radiators and boilers, as well as limescale deposits from mains water, all of which can cause considerable problems. Condensing boilers are precision-engineered and designed to run with clean water in the system. When system water becomes contaminated it can quickly cause radiator blockages as well as damage to key components in the boiler and heating system. This leads to a loss of radiator heat, increased system noise and potentially failures. It also means a shorter life for the overall system and a dramatic reduction in the boiler's efficiency, which affects comfort and adds to your energy bills. 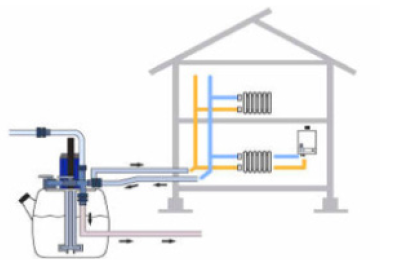 The Magnetic System Filter has been specifically designed to combat the damaging effects of system debris and pollutants by capturing contaminants before they reach your boiler. Using powerful and innovative magnet based technology, it is instantly effective at protecting the performance of your heating and hot water system, ensuring a warm and quieter, blockage free system.